NEW PLYMOUTH, New Zealand—The choice of a HARMAN Professional Solutions integrated system­—featuring JBL loudspeakers, Crown amplifiers and dbx signal processing—­is proving to be the perfect match for the stylish, 4.5-star Novotel New Plymouth Hobson hotel in New Zealand’s Taranaki region. The hotel required an elegant audio system to provide premium sound quality, coverage and control of its many areas. Local integrator TSH Audio & Video worked closely with Jands, the New Zealand HARMAN Distributor, on the audio design of the project. TSH Audio & Video (formerly Taranaki Sound Hire) has been installing innovative AV systems and supplying technical hire services to the Taranaki community for more than 40 years. Established in 1988, Jands is a specialized distributor of world-leading audio brands in New Zealand. The hotel’s distributed sound system is controlled with a dbx by HARMAN ZonePRO 1261m digital zone processor. The ZonePRO family of fixed architecture audio processors offers a high-quality, cost-effective solution for commercial audio applications. The system is managed by several ZonePRO Ethernet controllers throughout the venue. An array of JBL loudspeakers was selected for this installation, including the new JBL Control 31 loudspeakers installed in the conference room. Part of the JBL Control Contractor Series, they feature extremely smooth frequency response and extended bandwidth for high quality sound. JBL Control 24CT-M ceiling loudspeakers with wide 150-degree coverage were installed throughout the venue for background music, including inside the gymnasium. In addition, JBL Control 25T loudspeakers were installed to provide music for the outdoor deck/dining area. 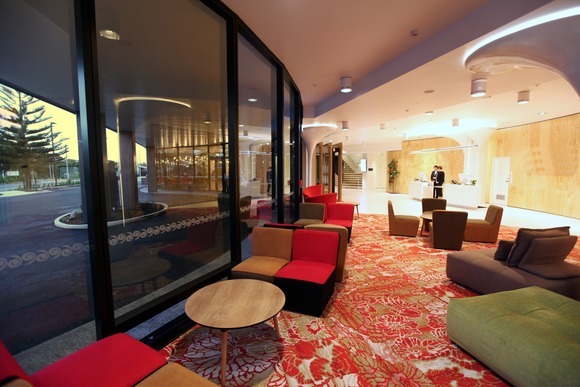 The audio system at Novotel New Plymouth Hobson is powered by Crown DCi 2|300 and Crown DCi 4|300 multichannel amplifiers. Crown DCi high-performance amplifiers are designed, engineered and manufactured with the highest quality standards and provide system integrators with a versatile, compact and highly energy-efficient amplifier. “TSH was very pleased to be involved with the construction of this iconic New Plymouth project and to be working with Jands to specify a high quality audio system,” said Evans. “Jands provided us with quick turnaround on design changes and the HARMAN vast toolbox of products came in handy when we had to come in under budget."